IOS or Investors Overseas Services Limited was created in 1955 by Bernard Cornfeld. Cornfeld was born in Istanbul in 1927 but was educated in the US where he joined the US Maritime Service and was a Ship's Officer for three years. He went on to study Social Psychology prior to the inception of IOS, something that may have contributed to his very successful 'American sales' techniques that he and his company practised, and many other more traditional firms disliked. The company was initially extremely successful and became well-known but it was soon the focus of authorities questioning its practices in the US. IOS moved its main operation to Geneva and focussed on European instead of American investments, working mostly for expatriate USA clients. There were international investments and clients too, however an article that appeared in Newsweek on July 28 1969 noted, "IOS salesmen have sold to the Eskimos, African tribal chiefs and Nepalese Sherpas in their never-ending quest for more business." Whilst that may be slightly tongue-in-cheek, the sentiment seems true – IOS’ focus did seem to be on diversity of clients and investments. By the 1960s, Cornfeld had already purchased a large amount of shares in renowned luxury Swiss watch maker Patek Philippe. As a reward for hard work and fuelling company growth, IOS associates who achieved an annual turnover of $1m or more were presented with a Patek Philippe IOS wrist watch. It is said that the fall of IOS contributed to, and was a significant part of, the financial crash of 1970. A combination of unsuccessful investments and eventually fraud by those such as Robert Vesco led to the end of the company, and only around 1500 of the Patek Philippe IOS model were ever produced. McTear’s is pleased to present a Patek Philippe IOS Million Dollar Associate wristwatch in The Watches Auction on 9 April 2019. 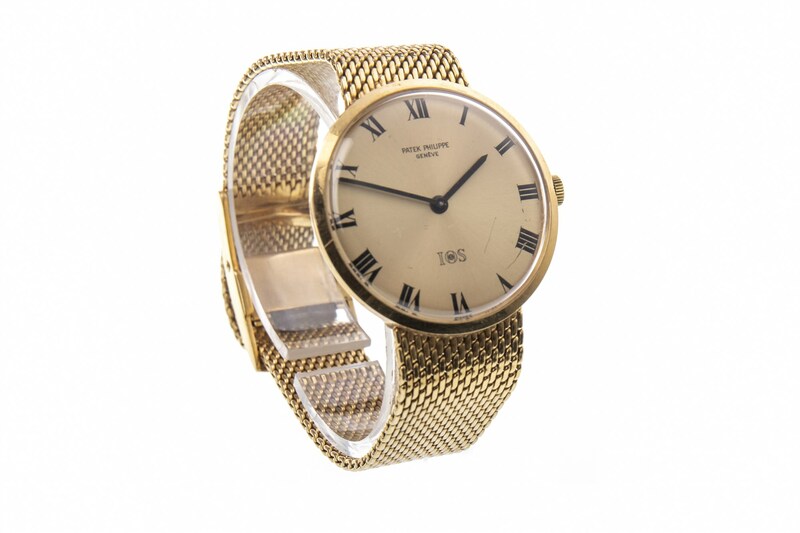 The original recipient of this watch, Martin Brooke, was a Director of IOS, appointed in March 1969. The afore-mentioned Newsweek article mentions Brooke in very complimentary manner, believing his appointment to the board at IOS to be a positive, credibility-giving move. Brooke, along with other UK bankers including Sir Harmar Nicholls, worked to salvage International Life Insurance, the British arm of IOS, which was ailing following the troubles and adverse publicity surrounding IOS. A controlling percentage was purchased by Keyser Ullman Holdings and a smaller percentage by Sir Edward Du Cann who was a Conservative politician. ILI was renamed Cannon Assurance of which Brooke was also a director and this ultimately became a very successful enterprise. Brooke’s timepiece encapsulates a history of revered Swiss watch making and domestic and international finance as well as his personal and professional story. It features at lot 756 in the auction and is estimated at £4000-6000. McTear’s sells more watches than any other traditional auction house in the dedicated watches auctions that take place monthly, run concurrently live online on a platform that attracts six million visitors annually from over 120 countries worldwide.